We are delighted to share with you the upcoming 2 day program celebrating Alon Goshen-Gottstein’s work in theology of religions, on the occasion of his 60th birthday. The program is scheduled to take place as part of the World Congress of Jewish Studies. Alon’s work and publications will be reviewed and engaged by some of the most prominent personalities in Jewish studies. 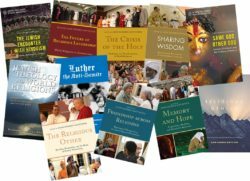 Both his work in theology of religions and his work in collaborative interfaith studies will be featured, as each of the books he has written or edited receives detailed review, and as the ensemble opens up a conversation from the perspective of Jewish theology of religions. The program is co-sponsored by Elijah Institute and the Elyashar Center of Ben Gurion University. Thanks go to Prof. Haviva Pedaya for initiating this program. The program will take place Sunday August 6th and Wednesday August 9th at Mount Scopus campus of Hebrew University of Jerusalem (hall 2772 on Sunday and hall 2802 on Wednesday). Highlights will be uploaded to our YouTube channel or shared on our facebook page. Following is a detailed program of the 2 day event (H=Hebrew; E=English). We look forward to seeing you. Contemporary Hinduism: Idolatry or Monotheism? What Makes One a “Religious Genius” ? 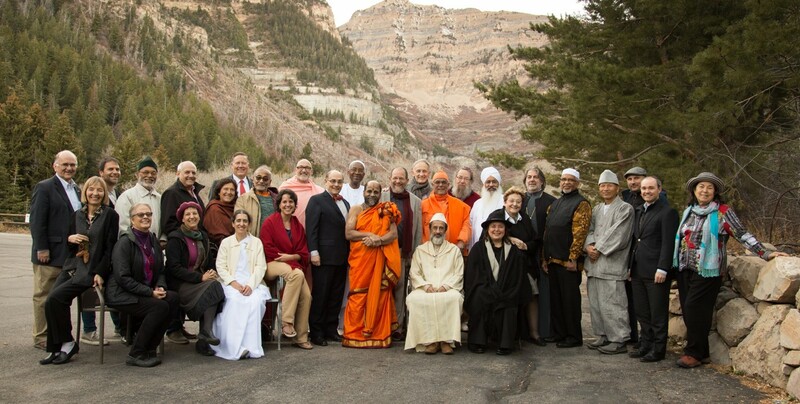 The friendship message of the world’s most prominent religious leaders continues to spread. Outside estimates suggest that the campaign has come to the awareness of between 150 and 200 million people globally. The views of the lead clip on YouTube are growing by the minute. At the present rate of growth, we are only a few days away from having one million views, and going strong. The success of the campaign does not stop at getting the message out. It is a call to action. We have had hundreds and hundreds of new subscriptions and downloads of our friendship toolkit. We would like to hear from you what you have done with the toolkit and how you have been able to translate the friendship campaign into your life. Please send us pictures, stories and testimonies to info@elijah.org.il, or post them directly to our facebook page. As the stories come in, the campaign will spread further. Please help us to spread the word. We are in the midst of our Jerusalem summer school program. The theme has been sharing wisdom, but we have also kept friendship as part of our focus. Here is a snippet from our summer school materials, devoted to one special friendship, that between Mahatma Gandhi and his closest friend, the Christian pastor Charlie Andrews. 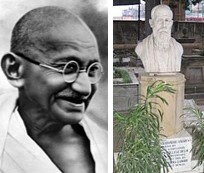 When scholars of the Elijah Academy prepared papers for the 2012 meeting of the Elijah Board of World Religious Leaders on the theme of “Friendship Across Religion,” Christian scholars, Miroslav Wolf and Ryan McNally chose as a case study the relationship between Charles Freer Andrews and Mahatma Gandhi. Anantanand Rambachan chose the same example, looking at it from the Hindu perspective. Charles Andrews was the son of a Christian minister belonging to the Catholic Apostolic Church, but later joined the Church of England. From 1914, until his death in 1940 Andrews worked closely with Gandhi in the Indian independence movement and in the service of India. He was perhaps Gandhi’s closest friend and certainly the only person to call the Mahatma by his first name “Mohan.” Gandhi, in turn, addressed him as “Charlie.” Their friendship blossomed quickly and remains an illuminating example of a relationship across religious traditions. Gandhi and Andrews differed considerably in background and training. They were both deeply committed to their respective religious traditions and their primary motivation in life was religious. They saw in each other, however, an earnest fellow seeker after God. The shared quality of openness to deeper understandings of religious truth was complimented by a deep concern on the part of both men to live their lives as servants of the poor and the oppressed. One of the most striking features about Gandhi and Andrews’s friendship is the degree to which it not only survived but flourished through frank speech. Each felt free to challenge the other, often using the other’s own tradition to do so. Gandhi and Andrews remained rooted in their respective religious traditions, but the quality of religious seeking inspired them to cross boundaries. They recognized that the Truth they sought was always greater than the traditions to which they belonged and they sought to learn from each other. They provided participants in the summer school with a concrete illustration of how interreligious friendships between scholars and spiritual seekers lead to profound sharing of wisdom and how sharing wisdom deepens friendship. By speaking in the voices of the characters themselves, participants identified with the motivations, the doubts, the fears, the joys and the dilemmas each of these great men felt and experienced. The four kinds of good friends are: 1) ‘the friend who is a helper’, 2) ‘the friend who is the same in happy and unhappy times,’ 3) the friend who points out what is good for you”, and 4) the friend who is sympathetic.’ The Buddha then describes the qualities associated with each of the four types of friends. The friend ‘who points out what is good for you’ is clearly seen as a moral and spiritual guide, since he is described as someone who “keeps you from wrong-doing, supports you in doing good, informs you of what you did not know (i.e. his understanding of moral and spiritual matters)…and points out the way to heaven.” Other qualities described in the four types of good friend are loyalty, trustworthiness, intimacy (keeping and sharing each other’s secrets), love, selfless service, and willingness to sacrifice one’s life for the other. In contrast to this, the four kinds of bad or false friends to be avoided are 1) ‘One who takes (instead of gives),’ 2) ‘One who is a great talker,’ 3) ‘One who flatters (or only says pleasant things),’ and 4) ‘One who is a fellow-spendthrift or debauched companion.’ Again, four detailed characteristics are given of each type. The Buddha’s advice to Sigālaka to avoid contacts with those who are not devoted to practicing good is common-sense, and underscores the teaching of the importance of true spiritual friends on the path. Maurice Walsh 1995 (transl. ), p. p.461-9, verse 24, Subhuti, 2004, p. 44. Bhikkhu Bodhi, 2000 (transl. ), p. 1524-55. Is good friendship something just to enjoy or is it important? In what way? What is meant by ‘this is the entire holy life’? Is the emphasis on ‘holy’ or is it on ‘life’? Do the qualities of the ‘good’ and the ‘bad’ friend resonate with you? Would there be other characteristics you could attach to ‘good’ or ‘bad’ friends? Why do you think the word ‘friend’ is used for a ‘bad’ friend? This source is an extension of source 1 and considers the benefits of having Buddha as a friend. Is it beyond the scope of normal interpersonal relationships to have such benefits or can a true friend really have such an impact?